This is SPOT ON right now... Am I a hot mess or what? One moment I'm all dreary and sad and the next BAM! hyper and caffeinated Nay. I get whiplash just thinking about my moods lately. Usually I'm like this during the "dreaded monthly visit", but jeez, it's getting to be on the daily. I have been so weird lately and not having my bearings for some time now. Who am I kidding? I have a feeling I've always been this way and just noticing it now. I'm happy. I'm sad. I'm anxious. I'm relaxed. I'm concentrated on a task. Then...totally procrastinating or "SQUIRREL!" Maybe this is what happens at about "that age"? You know what I'm talking about, right? THE CHANGE. Um, why is it called that, by the way? Shouldn't it be called THE OH THANK GOODNESS IT'S OVER? But then I think how much more of a mess and weirdo will I become when the real mood swings, hot flashes, and everything else starts? Oh Sweet Jesus! And how long is it going to take for THE CHANGE to, well...change me? Who will I become? Maybe it'll be for the better... ? Who am I kidding? If this is how I am now, I feel terrible for my husband for what's to come. See, when it's about "that time of the month" around these parts, I have to warn my husband that I am not responsible for what words, actions, and responses he gets during that period of time. I'm a blazing mess. And now...it's not only happening when I'm on "it", it's happening all the time. But the other day, my hubby said something that made me feel a little better... I'm paraphrasing, but you'll get the idea: Me: Do you like me? I mean, I know you love me, but do you LIKE me still? Hubby: Yes, baby. Me: Are you sure? Because I'm a little off most of the time... Hubby: The way I see it, you are YOU when you're with me. No one else sees the real you except me. So I think to myself that I'm lucky that you feel comfortable to be weird and you around me. So, yes I like you. I love you 100% and Like 95% of the time. There's always going to be that 5% that you drive me crazy. That's normal. You probably don't like me 50% of the time. And that's okay...I know. Me: (quiet for a minute) Yup. 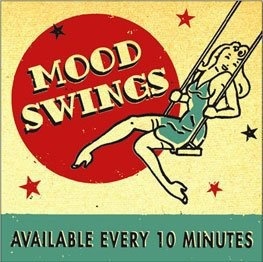 So, yes I'm moody. Yes, I'm a tad bit crazy. And, yup, I may have some OCD and Bipolar-ish tendencies. And that's okay. Well, the Hubby's okay with it. So I'm good. I laughed out loud! That's like a conversation between me and the Hubbs! I love ya! My husband would tell me that I'm making his eye hurt halfway through that dialog. LOL! bahahaha - my husband and I have had that same conversation. And it shook out much the same way too. =) Yay for our great men! I love it when you're hyper it makes me feel so much better about me all the time hyper Pidg. I like you 101% of the time and love you even more! Oh you crack me up. I don't feel sorry for Po at all... I've paid my dues... 6 kids, dude, the men should go through the change! I am embracing "the change"! Especially as an excuse for my forgetfullness and moodiness. Not my fault, it's the perimenopause! Ha ha! So far I am making jokes about it and blogging to deal with it. Haven't spilled any blood so far, so I think I am doing okay. So, first of all...LOVE your site and domain name. Coffee-n-ink...perfect! I had another blog called Chocolate Ink (mostly for family stuff), and I LOVED the concept of my two loves (chocolate & writing, but coffee would fit in there too). But wanted to be more intentional about writing about my faith, so There Is Grace was born. Anyway, I digress...TOTALLY can relate to this post! Love that conversation you had with your hubby. We've had some similar ones around here. Sounds like you've got a great man there. Makes a HUGE difference, doesn't it? You have the best husband ever. Not that you need me to validate that, but you really do. Also, I am like this all of the time. Why is it so hard to be a woman sometimes?